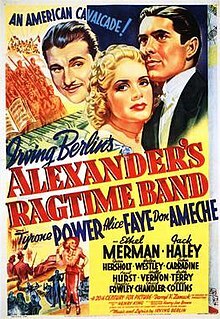 Alexander's Ragtime Band is a 1938 musical film released by 20th Century Fox that takes its name from the 1911 Irving Berlin song "Alexander's Ragtime Band" to tell a story of a society boy who scandalizes his family by pursuing a career in ragtime instead of in "serious" music. The film generally traces the history of jazz music from the popularization of Ragtime in the early years of the 20th century to the acceptance of swing as an art form in the late 1930s using music composed by Berlin. The story spans more than two decades from the 1911 release of its name-sake song to some point in time after the 1933 release of "Heat Wave", presumably 1938. It stars Tyrone Power, Alice Faye, Don Ameche, Ethel Merman, Jack Haley and Jean Hersholt. Several actual events in the history of jazz are fictionalized and adapted to the story including the tour of Europe by Original Dixieland Jass Band, the global spread of jazz by U.S. soldiers during World War I, and the 1938 Carnegie Hall performance by The Benny Goodman Orchestra. There are no mentions of the primary importance of blacks in creating and playing jazz anywhere in the film. The story was written by Berlin himself, with Kathryn Scola (1891–1982), Richard Sherman (1905–1962) and Lamar Trotti (1900–1952). It was directed by Henry King (1886–1982). It is believed by some that both the song and the movie were inspired by a real bandleader, Alexander Constantin Jr. of New Orleans (also known as "King" Watzke), and his band, Alexander's Ragtime Band, which was popular c. 1904-11. King's Men as Singing Army Quartet - Y.M.C.A. Alexander's Ragtime Band features several hit songs by Irving Berlin including "Heat Wave", "Some Sunny Day", "Blue Skies", "Easter Parade", "A Pretty Girl Is Like a Melody" and "Alexander's Ragtime Band". Previously released songs were re-arranged and used in conjunction with new songs written by Berlin for the film. 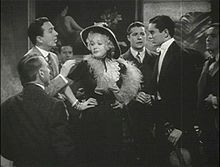 The film had its New York premiere at the Roxy Theatre on August 5, 1938, with Cuban bandleader Desi Arnaz heading the stage show. Contemporary reviews from critics were positive. Frank S. Nugent of The New York Times wrote, "With those twenty-six Berlin tunes at its disposal and with such assured song-pluggers as Alice Faye and Ethel Merman to put them over, the picture simply runs roughshod over minor critical objection and demands recognition as the best musical show of the year." Variety wrote, "Superlative in conception, execution and showmanship, it provides a rare theatrical and emotional experience." Film Daily declared it "solid entertainment that should play to big returns." Harrison's Reports called it "Excellent entertainment, capably directed and acted." Russell Maloney of The New Yorker called the music "reason enough to see the film," though he criticized the "small, persistent, mosquitolike irritation of the plot" and instances of anachronistic dialogue. Song – Irving Berlin for "Now It Can Be Told"
Alexander's Ragtime Band was presented on Lux Radio Theatre June 3, 1940. The adaptation starred Faye and Robert Preston. ^ "Alexander's Ragtime Band (1938) – Notes". Turner Classic Movies. Archived from the original on 2012-01-13. Retrieved January 7, 2012. ^ Brown, Gene (1995). Movie Time: A Chronology of Hollywood and the Movie Industry from Its Beginnings to the Present (paperback). New York: MacMillan. pp. 141–2. ISBN 0-02-860429-6. ^ The New York Times Film Reviews, Volume 2: 1932-1938. New York: The New York Times & Arno Press. 1970. p. 1520. ^ "Film Reviews". Variety. New York: Variety, Inc. June 1, 1938. p. 12. ^ "Reviews of New Films". Film Daily. New York: Wid's Films and Film Folk, Inc.: 3 May 28, 1938. ^ "Alexander's Ragtime Band". Harrison's Reports. New York: Harrison's Reports, Inc.: 123 July 30, 1938. ^ Maloney, Russell (August 13, 1938). "The Current Cinema". The New Yorker. New York: F-R Publishing Corp. p. 47. ^ "NY Times: Alexander's Ragtime Band". NY Times. Retrieved 2008-12-10. Wikimedia Commons has media related to Alexander's Ragtime Band (film).